Cedar Wood Lodge is a spacious 4 bed home with family bathroom for walk in shower and bath, plus additional WC in the hall/lobby. The kitchen is open plan and leads into a very exciting longe / dining room with huge vaulted ceilings and bi-fold french doors onto an enormous decked pation. More for less at a price that won't hit the roof.. The Portsmouth Log House is a traditional round log building thats going to be around for a very long time. Features include 3 very spacious bedrooms, 2 en-suite bathrooms, WC, horse shoe style kitchen with patio doors leading to the rear exit and utility, dining area and large open plan lounge area. If there was an award for the Log House of the Year, the Lakeside Lodge would win it year after year. This traditional 2 bed house in 195mm Oval Log with Cedar Roof Shingles was co-designed with the owner who saw a plan in Australia, sketched it out and from there we turned it into this stylish home and provided additional contractors to complete the service for the extended decking. The Sark House is located on a beautiful cliff top overlooking the sea on the Island Sark in the Channel Islands. The Sark House is located on a beautiful cliff top overlooking the sea on the Island Sark in the Channel Islands. 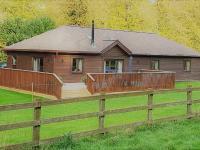 The owner has offered to make the house available for holiday lets. 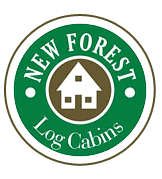 If you would like to try living in a log house before buying one, them call the office and we will put you in touch with the owner. The Ashley house has all the traditional style of a log house with those extra little touches added by the customer to turn it into a fantastic design and a beautiful home. 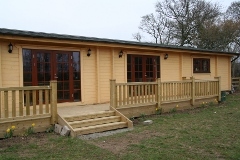 The Dorothy is a spacious Farmhouse Style Log Home with 3 double bedrooms, all with en-suite bathrooms, a large kitchen / diner and very comfortable lounge. To top all that, there is a utility / boot room with WC and French Doors into the Lounge and Kitchen. The external timber colour you choose and we offer a choice of interior finishes from traditional all wood, or you might prefer plasterboard which can be painted in your choice of colour. All the windows and doors are super efficient double-glazed for complete warmth and energy saving. The assembly is done in simple stages on site involving slotting the pre manufactured logs together and the building is completely weather proofed within a matter of days. Introducing the Long Ashes Log House. Traditional Log House with some unique design features. 2 bedroom on the ground level with a mezzanine floor leading to an addition room on the upper level. With the ever increasing demand for higher standards and better value for money it's hard to imagine the Yeovil can be constructed to last in excess of 100 years and yet still be classed as a temporary structure which makes this style of building ideal for the farmer wanting to set up a business with a licence to build a dwelling under the 3 or 5 year permitted development and then apply for permanent status. When considering the Carbon Footprint of your building, contrasting from wood as compared to "traditional build" structure is both environmentally friendly and energy efficient. Wood is a natural material and is therefore close to people's hearts and is the first choice for all seasons. Its insulation qualities ensure that heating and air conditioning cost are kept to a minimum. DTI Low Carbon Buildings Program Government funding for renewable sources of energy? 3 Bed Log House with built in Sauna.